Wait! What? Of course, the thing I am diligently, more clumsily maybe, trying to create already exists. I was torn between continuing my personal endeavor or throwing in the towel and signing up for their service. I don’t have anything to lose by peeking a little, right? What before my wondering eyes should appear? A full database of numerous publishers, including their genres, URL, pay rates, print or electronic or both, and length of submissions. Duotrope lists details I didn’t dream of such as the rejection versus acceptance rate and average response time based on user’s reports. There’s a deadline page that tells me when the publication will accept pieces. By playing around on it a bit, I have found that if you click on the list that has multiple authors submitting work already, that site usually pays for work. Sounds educational, but how do I keep track of my personal submissions? I am glad you asked. Under My Account, I can enter my stories with their genre, length, etc. Their user-friendly system allows me to keep track of where I’ve submitted an individual story, what responses I’ve received, deadlines, etc. I particularly like the “Saved Searches” page so I do not have to continuously go back to the search page and put in fantasy, short story, payment options, every time I’m ready to resubmit a story. Sounds too good to be true, you say. It must be financially out of reach for someone starting out. No, I assure you. You, too, can have the power of an all-encompassing database for only $5 a month or $50 for the year. I have only explored the site for four days now, but I am thrilled with what it offers. Only time and my own persistence will tell if Duotrope.com will live up to my expectations. The honeymoon is bringing much satisfaction so far. 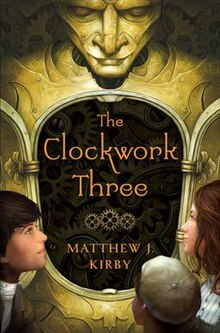 The Clockwork Three by Matthew J. Kirby explores the lives of three children at the turn of the century. A bit of speculative fiction is thrown when he spices up the story with a bit of magic, giving it a steampunk flair. Kirby masterfully weaves the lives of these seemingly disjointed children into a quilt of adventure. I enjoyed getting a glimpse of the historical world as well as the reasoning of a child which we adults sometimes forget.